Maisonette is duplex apartment. 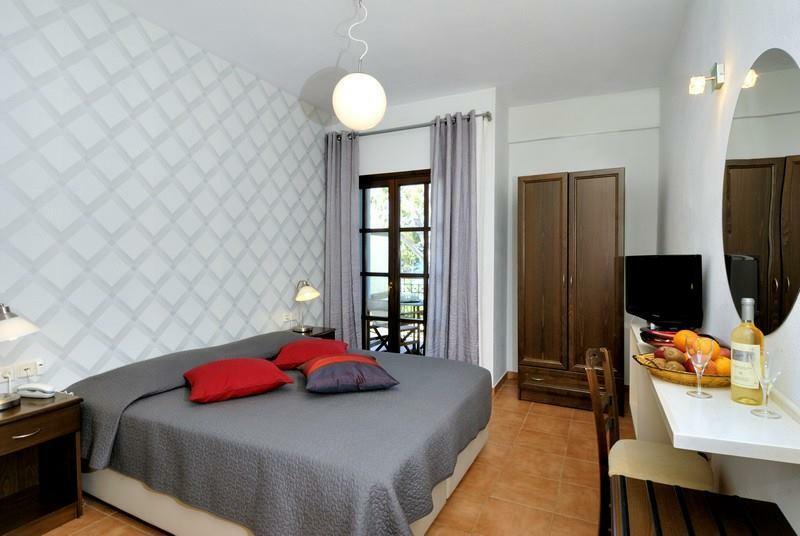 All bedrooms has their own balconies with magnificent view of sea and mountain. On first floor there is big kitchen with stairs going to bedrooms. As you pass the kitchen there is bathroom and living room. Living room has fireplace that can make your stay really pleasant. From living room you access the balcony where you have nice view and can have delicious and romantic dinners. As you get to second floor there is one more bathroom and 2 bedrooms. Also there are plenty wardrobe in each room so you do not have to worry about space. One-Bedroom Apartment. All Studios are on the ground floor, every one of them has one bedroom. There are 2 types of Studios depending how many people are staying (2-3). As you enter the apartment there is living room connected with fully equipped kitchen. Going right form the entering door you pass the bathroom and enter spacious bedroom. The bedroom has its own balcony. From balcony you have direct view to the pool. This is ideal for children and parents as you can watch them all time playing by the pool.